Deny it all you want, deep down inside we all want to be a Barbie girl. The great news is, even if you’re well into adulthood already, your Barbie days aren’t over just yet, thanks to Puma. The active brand has partnered with iconic brand, Barbie for a rather exciting collaboration that will have 90s girl weak at the knees. This nostalgic collaboration was dreamed up to celebrate 50 years of the Puma Suede sneaker and is bound to release your inner kidult. This summer, PUMA x Barbie brings to life your favourite childhood memories with a collection straight out of the Dreamhouse. Barbie has been an inspiration to little girls for almost 60 years, making her the perfect muse for a trendy throwback range of sneakers, clothing and accessories. This exciting capsule collection boasts two pairs of Suede sneakers in both Raspberry Pink and Black colourways. If you’re all about the pink life then the all-pink Suede (R2,299) will be right up your street. Featuring the iconic Barbie logo print with matching upper, pink sole, laces, collar lining, pink and white Formstrip, this delicious shoe is finished off with pink satin bow and plenty of sass. 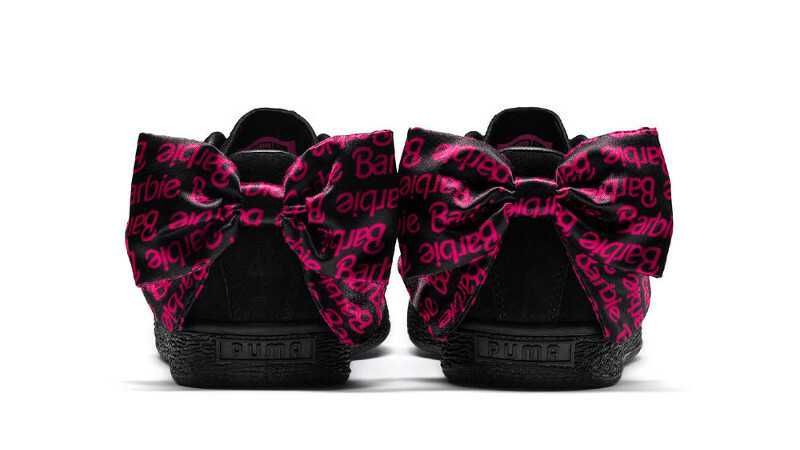 The black Suede sneaker (R1,899) features an all-black upper atop the classic black textured sole and a black and pink Barbie logo pattern on the Formstrip. A feminine touch is added to the shoe with a black and pink satin bow on the heel. Both sneakers come in a special anniversary shoe box and are available in women’s, kid’s and preschool sizes. If you’re looking for clothes to match, the collection offers something for everyone to swoon over. Keep it simple with a black PUMA x Barbie racerback crop top (R799) featuring the Barbie logo and PUMA mesh inserts on the straps and chest for breathability and added comfort. Wrap up in the PUMA x Barbie T7 hoodie (R1,899), which offers an oversized fit and features panels with all-over black Barbie logo print. Complete the look with a pair of T7 leggings (R1,299) that have the all-over black Barbie logo on the sides of the leg panels, a black Barbie-logo baseball cap (R399), and a nifty hold-all backpack (R999). Find the PUMA x Barbie collection at PUMA Select stores from 6 December 2018.